Modern thread is offered in a variety of fiber types. Today’s quilting world has so much diversity and, thankfully, most machines can run a variety of types of threads. 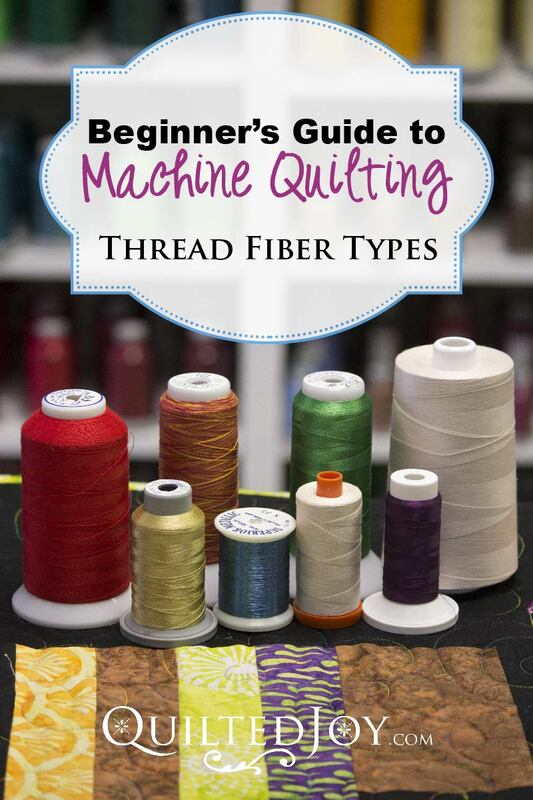 Of course when you’re machine piecing, you’ll want to stick with your trusted cotton thread. Of all the thread fibers out there, cotton will best withstand the heat from a hot iron while pressing. When you’re machine quilting you’re free to experiment with a variety of thread types! When selecting your thread, you should first look for a strong thread that has consistent thickness, regardless of the fiber type or color chosen. Avoid threads with nubs and clubs. Uniformity in the thickness of the thread will help maintain consistent tension on your quilt. In the quilting world, polyester is king. The days of cotton purist thinking are in the past as modern polyester thread has gone through an impressive evolution. The benefits of polyester thread are numerous. Poly thread does not shrink or stretch. It is colorfast and safe for washing, drying, and even dry cleaning. It is available in weights ranging from 30 wt to a super-skinny 100 wt., plus it is strong, durable, and won’t break easily which makes it perfect for high speed stitching on a machine and it is low lint, too. Excessive lint is a sign of a low quality poly thread and it should be avoided. My favorite polyester thread brands include Glide, So Fine and Omni. A++++ beautiful colors, easy to use. Great products. Used the thread from this collection for a recent quilt. It was the best quilting experience with my machine I have ever had. The stitches were each perfect and not a skipped stitch while quilting. Was also absolutely stunning on the machine binding. Glide thread looks fabulous on the quilts! I am enjoying using Glide thread. It has such a good appearance on the top and bottom of my quilts. Because it melts at such a low temperature, Nylon is often used as a fusible thread. Great care must be taken to prevent a quilt with nylon monofilament from going into the dryer or being exposed to sunlight for a long period of time as it will break, melt or discolor. The chemical name for Nylon is Polyamide. Check your decorative threads for this name as sometimes the thread manufacturers won’t use the word Nylon on their decorative threads. High sheen and reflects light really well but it isn’t as strong as poly or cotton. It is often not colorfast. It doesn’t like high heat. It is less durable than cotton or poly and cannot withstand bleach. I do not use Rayon in my quilts. Metallic is great for couching from the top, bobbin couching, and other decorative applications. It is the floozy of the thread world and will really draw the eye when used on a quilt top so use it judiciously and with careful intent. Larger stitch lengths will show more bling and catch the light more readily. Pay attention to how the thread is wound on the cone or spool. Thread conditioners may help finicky metallics run more easily. For high speed quilting, like longarm quilting, you will generally prefer a metallic thread with a nylon core which adds some elasticity to the thread and allows it to run in the machine a little more easily. As an alternative to finicky metallic threads, use a trilobal polyester that looks identical to metallic threads and it will run much easier in your machine! Glide has a variety of colors that look exactly like metallic. The modern monofilament threads sold today is soft, thin, and blends beautifully into the variety of colors in your quilt top. Monofilaments are great threads to use for stitch in the ditch quilting as it is very forgiving. It is also a great choice around appliqué. Use it to outline applique shapes to give it dimension knowing that if you wander over the top of some of the applique the thread won’t draw the eye to the mistake. Because it is so difficult to see, it is best to avoid using invisible thread on baby quilts. If the thread comes loose it is very easy for it to wrap around baby’s fingers or toes and it could cut off circulation quite easily. Nylon Monofilament- Nylon has a low melting point and should not be used on quilts that will get exposed to heat or an iron. Quilts using Nylon Monofilament should also be kept out of the sunlight. Over time Nylon has a tendency to yellow and become brittle with age. The benefit of nylon monofilament is the diameter. This thread is incredibly thin and it doesn’t catch the light much so it is a perfect choice when the quilter wishes to sculpt around an applique without drawing the eye to the thread itself. My favorite nylon thread is Essence– either clear or smoke. Polyester Monofilament- Poly is much more durable and can withstand being thrown in the dryer or hanging in the sunlight. It catches the light a little more readily so on some quilts it talks louder than a nylon monofilament. It comes in two varieties: Smoke or clear. Smoke is for dark fabric and clear is for light fabric. My favorite polyester monofilament is MonoPoly— in both smoke and clear. If you’d like to use it in the bobbin too, you can get prewound bobbins of MonoPoly! Cotton thread comes in a wide variety of colors and weights. It works beautifully for quilting in domestic sewing machines. A good quality cotton thread will have relatively low lint. While cotton thread will give off more lint that poly thread, it shouldn’t be excessive. It absorbs light with no sheen. It will have a diminished look and gives the fabric a folksy feel. Most wool thread is too fragile and too thick to run in a machine with a long thread path. Most silk is a super skinny 100 weight thread that is very forgiving and it nestles down in the fibers to allow for very dense quilting without the unsightly build up found in other types of threads. This thread type is very popular on competition quilts and runs wonderfully in many machines. The key is to slow way down and to use a smaller needle. Are you ready to try out some new threads? How about 10% off thread to get you started! Use code threadlove10 to get 10% off all threads in the store! Limit one use per customer, code expires Feb. 14, 2017. Next post: Cardinals, Cardinals Everywhere!